My Beyond The Xtra Mile Project is a new learning pathway that I have invented for myself and I hope to convey it well enough here, so that it might catch on. I can see this being the learning pathway of the future. First of all, the website you are looking at - Beyond The Xtra Mile.com - is a web presence that I created to be the “vessel” for all my finished work, ideas, and discoveries throughout my Independent Study project. This idea was inspired by a talk I saw when I was twelve by Sir Ken Robinson. In his talk, Robinson discusses how schools are killing children's creativity. By segregating subjects children loose the opportunity to make connections between disperate ideas.This ability to make connections is crutial to a creative mind, and if schools are not teaching, and even discouroging, connection making they are destroying opportunites for creativity. This may be a wonderful revolution for those in the teaching professions as well. A system like this would inspire them to tap into their creativity and innovative spirit to work with students in a more personal way. Naturally working with students who are more motivated learners would be amazingly enriching and exciting. Who knows what the outcomes and possibilities may be? Is the next Albert Einstein or Steve Jobs sitting bored in some classroom somewhere in America right now? I had no previous knowledge of computer programming in September of 2012 when I started teaching myself web design. I knew how to use Microsoft Word and PowerPoint, and that was the extent of my computer experience. But after just one month of school, I had amassed quite a lot of work in my Independent Study and I realized that I needed somewhere to share this process of discovery with others. I found a local IT expert - Patrick Warn - who agreed to tutor me in computer programing and website construction, found a book that we could use as a text book, and in 10 weeks, from scratch, I created the website that you are looking at right now. So why not just go through high school the normal way? It all started in August of 2012 when I was asked to try an experimental learning pathway that our high school had developed called “Academy 21.” In this new kind of classroom, the student's interests would dictate their learning journey rather than the teacher‘s syllabus. In theory, this would allow much more freedom than the current system and students would be more inspired and self-directed. I think the concept is great and I have friends who love the program so far, but I wasn‘t convinced that it was the right resource for me. Fortunately, my sister, Liesl, was home to attend the information meeting about Academy 21 with us and she had some serious reservations. (She‘s a sophomore at Harvard, so she is used to fact-checking everything!) Liesl worried about how all this would translate into a normal transcript, so important to college applications, and being a consummate skeptic, she worried that there was no data to support the successes of such a learning pathway. But my sister‘s biggest misgiving - and the one that we trusted the most in the end - was that she was worried about my missing all the delightful and great teachers that my local school has to offer in the conventional AP learning pathway. Liesl presented a case for the value of those mentors that was absolutely impossible to ignore. She was adamant that I experience the teachers who had changed her life. And all that left us with a quandary: I had passions and gifts that I wanted to explore through high school - outside the normal classroom setting - and I wanted to get the best of these amazing teachers who Liesl referenced. So, I decided to create my own personal pathway that included both. Essentially, it would be something in between Academy 21 and conventional classroom “seat time”. I remember a moment when Mr. Hill jumped up in the middle of my oration and pointed excitedly at a conceptual diagram that I had drawn. I cringed, fearing the worst, and then he said, “That‘s it! That‘s it! That‘s exactly that way I think learning should be!" And I have been off to the races ever since! Mr. Hill gave me the freedom to take my idea and run with it, and as a “thank you” for his confidence, I have promised to create a pathway that anyone can follow, for years to come, after me. Because my academic explorations will be heavy on science, I asked Tim Fugere (chairman of our science department) to act as my official supervisor and he has been amazing. He has tirelessly helped me keep my promise to Mr. Hill concerning the fact that we are creating a whole new paradigm for education, and that we want other kids with special passions to be able to follow me in the coming years without reinventing the wheel. We have spent hours and hours laying that important initial groundwork for the future. I believe that classroom lecture can be valuable if a teacher is an excellent public speaker and an inspiring person who students can connect with. Absent those two skills, classroom lectures have almost no value to the student. Because BFA has some fabulous lecturers who inspire, I was not ready to throw that part of education out. Yet there are only so many hours in a day. And the depth and breadth of the course of study I intended would take many, many hours a day. So my proposal was that I take the four essential core courses - Mathematics, Bio, Social Studies, Writing - in a normal “seat time” manner, and then I would use all the rest of the school day to aggressively explore my passion for science and the way it relates to art and mathematics. My goal is to operate in the “gap” that most people think exists between science, mathematics and art. 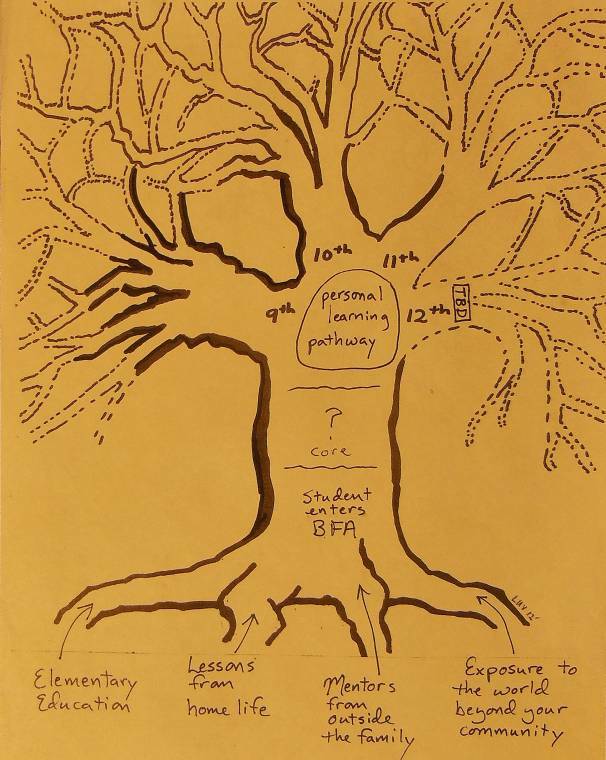 The trunk of the tree represents the core courses that the student will take to assure they have good skills in the essentials of writing, practical mathematics, and social studies. Next are the four branches, which are the four years of high school, each branch is the personal discovery path that the student wants to follow for that year. I have attended two previous schools: Christ the King and Fairfield Center School. As for home life, my parents have nurtured in me a deep love of reading, learning, art, science and being compassionate. My mentors have been many: my old school of Fairfield was full of great teachers. I also have had great coaches that have taught me a LOT from both basketball and fencing. I have a large family of cousins, aunts, and uncles, who are successful and unique characters. As for experience of the world, I have been a VERY fortunate child. I know that. Because of my parents work for international charities, they have made us quite the world travelers. Before the age of 14, I had been to 15 countries and we were not visiting normal travel destinations!... I have been to places like wildlife refuges in the Kalahari Desert. I have spent time in orphanages in Ecuador, and the IRA head quarters in Belfast, Northern Ireland. I have climbed extinct volcanoes, and paddled white rivers in the Czech Republic. So, naturally my personal perspective is that of a "global citizen". And maybe that's why I had the insight to create this system of learning: because I know the true potential of many, many children all over the world is being wasted by our current educational systems, and I believe I can change that. After you look at the formative roots of the tree, you get to the main trunk. My four main courses for this year are Accelerated English and Social Studies, Accelerated Geometry, and Biology. I‘m also taking Latin. And then here is where my concept of education literally branches off from the system we have had for a hundred years or more... The first year of my personal path of independent study will be about molecular biology, I am an avid metal sculpture and wish to know all the chemistry, and other kinds of science behind it. I have two mentors that will teach me about welding techniques and machining, Billy Michael and James Valencourt. The second year will be focusing on anatomy and physiology and connecting it to my art through kinetic sculptures. I hope to have an opportunity to go to the local college‘s (UVM) med school and work in the anatomy lab there. The third year I hope to have an opportunity to work with one of my parent‘s friends who owns one of the largest and most sophisticated personal telescope in the northeastern United States. Unfortunately, the telescope is broken right now, but my dad and I will offered to help the man fix it. The fourth year is to be determined. Naturally my fourth year will be informed and enriched by all the extra knowledge I will have gained in the next three years. This is not for the undisciplined mind! This path also entails A LOT of self-direction, organization skills, and an incredibly curious mind. It would fail for students who do not have an inherent passion for knowledge, but so many do! I have many peers who say they would love this way of learning if it was offered to them. And finally, the process of creating this website from scratch has been an amazing learning journey in itself, because it has forced me to solidify the pathway I hope the next student will follow. In closing, I would like to say that this website is the vessel that will contain all the pieces and parts of the personal journey I am on through high school at Bellow's Free Academy in St.Albans Vermont. I'd like to thank the school board for recognizing innovation and rewarding excelence.Their approval has been one of my greatest inspirations. This website will be available to everyone at any time and I hope it will inspire others to follow their own passions. Most of all, I hope it will leave some foot prints in the sand for other students. Well! It’s been three years since I wrote this and a lot has changed. I’m still going hard and mixing class time with my independent work, but the path I originally thought up, and my interests are very, very different. First of all I scrapped my original plan and spent the first year of my independent work time meeting the requirements to pass a bunch of little mandatory classes through projects and papers of my own design, through my lens of interest. The second year was much of the same, but I did discover my true passion, the perfect blend of science, artistic creativity, and technical innovation – biomimicry! This year, the third of my journey, I’ve finally gotten all the mandatory classes out of the way and I can really let my interests soar! It’s been wonderful, currently I’m developing a new model of wind turbine as well as blogging about various scientific, artistic, historical, or biomimicry related topics that fall into my lap. I hope that over the next year and a half I can continue to expand my knowledge of biomimicry and possibly make some of the ideas I’ve had a reality. Here are a couple links to two of the most insirational speakers on education that I have ever seen! ENJOY!